We are delighted to announce that Clintec has been selected for the EXCELLENCE IN SERVICE award out of the top 200 UK mid-market fastest growing companies with highest international sales. Out of these 200 fastest growing UK companies, Clintec ranked 84th and was presented the award by Alison Barto, Regional Corporate Director, North. 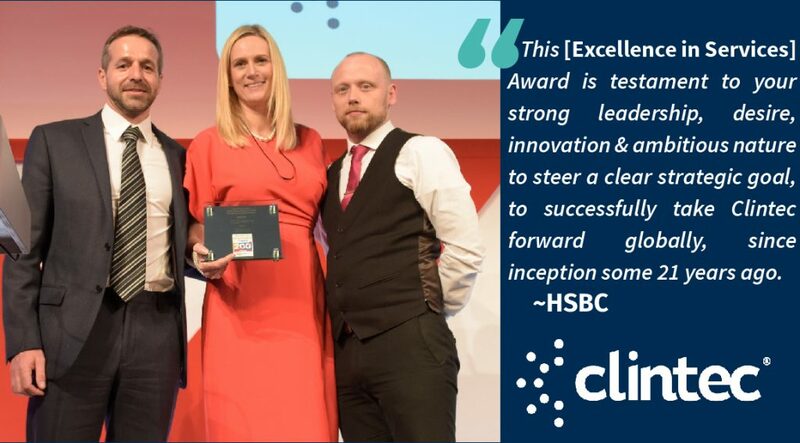 Clintec Chief Financial Officer, Gavin McKenzie and Financial Controller, Gary Steel collected the award at The Sunday Times HSBC International Track 200 Awards ceremony in London on the 11th of September (pictured). The International Track 200 league table ranks the UK’s mid-market private companies with the fastest-growing overseas sales over the latest two years. Visit http://www.fasttrack.co.uk/ for more information.